The mysterious slipping clutch problem that we've had the last few races showed itself again. When the car has been out on the track a while it seems like the clutch spring is too week to reengage. In the past a quick bleed fixed the problem, but it would reappear at the next race. After a few laps out Craig reported that the clutch was slipping. We brought him in and did a quick bleed. That seemed to fix the problem somewhat, but both Nick and Mark could feel the soft pedal in their stints. While their stints had been uneventful besides the clutch issues, I managed to spice things up with our exhaust falling off and a black flag. Our eBay cat broke at its weld while I was driving. The noise level in our car went from 80dB to about 120 instantly. At first I thought my ears had popped like the atmospheric pressure had changed. Then I thought I was getting passed by a sidepiped big block. I finally realize what had happened and brought the car in. Since we weren't pointing the exhaust anywhere dangerous and I wasn't breathing the fumes we took it back out. It was loud. It was hot. The cool seat only seemed to last for the first 45 minute of our 2 hour stints, but it was still better than nothing. I had been running back and forth with the Sta-Puft Marshmellow car, a huge Mercedes luxo-barge. After several laps we ended up heading into turn one with me on the inside. I locked up the brakes and slid into his door. It was a pretty decent hit, but we both kept it pointed down track. Had my target not been twice my mass he might have spun. They let us slide by with a driver change since it was a first offense. We ended up not needing the get out of jail free card Mark and I earned by helping Phil figure out the headlight switch failure issue on his borrowed Beemer. We bled the clutch once more, and Craig, Nick, and Mark got another stint in before the end of the day. We made a parts run to Camden and picked up a new cat as well as a new clutch master and slave. The entire clutch assembly needed to be removed to swap the master and we took the opportunity to remove the balancing spring that was left over from the cable clutch. (Astute readers will remember that this generation of Civic typically had a cable clutch) I also welded (badly) a piece of steel to help reinforce the frankenpedal. 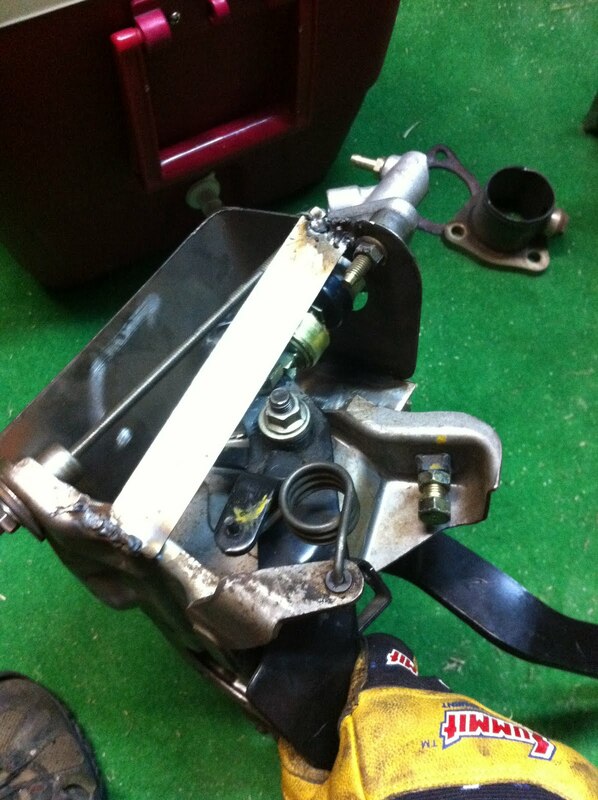 We had harvested the hydraulic system from the original donor Integra and made our own hydraulic clutch pedal. 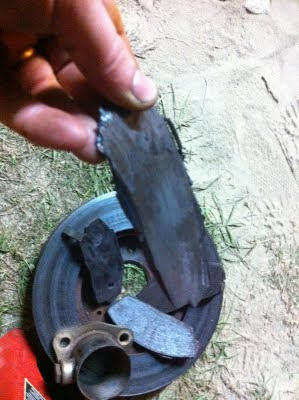 Fortunately we had an extra set of pads and rotors, but we still didn't get to bed until 2AM.